Gilbert Davey's articles in the Boy's Own Paper had won him an enthusiastic following among its readers in the years after World War 2. His popularity was boosted by his broadcasts on BBC Children's Television in 1957 and 1959. This section of the site is devoted to these broadcasts and the radio receivers they featured, and brings together most of the material this site contained when first launched in 2010, as well as newer material. 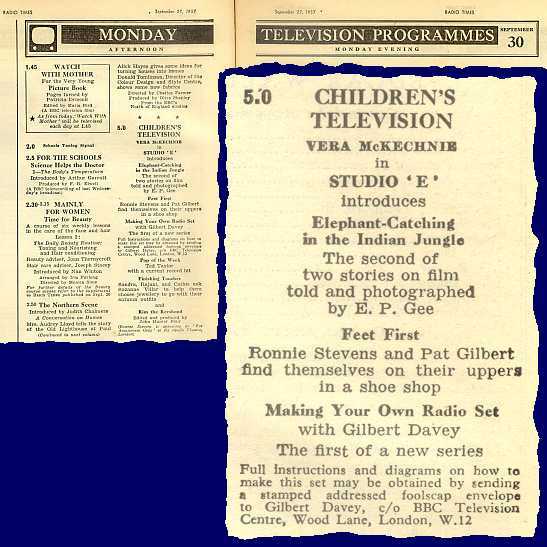 In the late fifties, BBC Children's Television carried a programme on Mondays at 5pm, called Studio ‘E’, produced at Studio ‘E’, Lime Grove Studios, London (now demolished). It was not the first BBC magazine programme for children; predecessors included Whirligig, Saturday Special and Telescope. Hosted by Vera McKechnie, Studio ‘E’ included talks, travellers’ tales, music, comedy and "how to" features. It was later re-named Focus. These programmes and their predecessors served as jumping-off points for some well-known figures who went on to long-standing TV success. Before you ask, Blue Peter began in 1958, initially running in tandem with Studio ‘E’ and Focus but with content aimed at young children. Later, Blue Peter extended its remit to children of all ages, supplanting the earlier programmes but building upon their lead. listing shown in enlarged inset. On Monday 30 September 1957, Studio ‘E’ began a six-part series presented by Gilbert Davey, showing viewers how to build a simple one-valve battery-operated radio receiver. The programme's Radio Times listing for that day told viewers how to send for a leaflet of diagrams and step-by-step instructions. It was later reported that within a few days of the first programme, Davey had received over 26,000 letters! Radio Times did not repeat the note on how to send for the leaflet. According to the Radio Times, the following two Studio ‘E’ programmes (7 and 14 October) did not carry the series. The pause was probably calculated to allow the BBC to tackle the volume of requests, and to allow dozens of radio shops to gear up to sell kits of parts. The series resumed on 21 October, and concluded on 18 November. What can account for this high level of interest? There may be several answers. First, Davey already had a huge following among readers of Boy's Own Paper. Secondly, as a practical project with clear and precise instructions, it was bound to have good take-up. Thirdly, interest in science among young people, probably greater then than now anyway, received a sky-high boost when on 4 October, just after the series began, the Soviets launched Sputnik I. The little sets worked well, taking advantage of the well-tried technique of reaction, in which part of the output is fed inductively back into the input, giving an enormous increase in sensitivity. My set pulled in Radio Luxembourg - the only station I thought worth listening to - just fine. My Original Studio ‘E’ Set - Undiluted nostalgia - memories of my original Studio ‘E’ 1-valve set. My Rebuilt Studio ‘E’ Set - Details and pictures of my Studio ‘E’ set, now rebuilt (for the second time!) largely according to the leaflet. The Studio ‘E’ Leaflet - Comments on the 1957 leaflet and on the design itself. Downloads - please read the copyright and usage notes on that page, and the copyright notice on the WELCOME page. The Studio ‘E’ Scripts - Extracts from the scripts preserved by Gilbert Davey himself since the one-valver series was broadcast in 1957. Note: Your Studio ‘E’ Rebuild has now been replaced by a new page, CONSTRUCTION RESOURCES. This contains most of the material from the old page, but will be expanded with resources useful for Davey sets in general - or indeed any vintage radio project. Until the late fifties, the thermionic valve had reigned almost unchallenged. Transistors were at first expensive and difficult to obtain, variable in performance, and relatively untried by amateurs. For these reasons, Gilbert Davey had excluded transistor designs from his first book, Fun with Radio, published as the Studio ‘E’ 1-valver series was being aired. However, during 1957, he had already published two designs for simple transistor radios in Boy's Own Paper. In March-April 1959, Davey was back at the BBC with a five-part series for a simple two-transistor-plus-diode design. In the intervening months, Studio ‘E’ had been renamed Focus, but was still fronted by Vera McKechnie, and (as far as I know) still produced at Lime Grove Studios. This title seems to be less well-remembered than Studio ‘E’, perhaps because those who watched this second series assume it must have been carried by Blue Peter which had already started as noted above. The Radio Times listings indicate that a similar format as for the earlier series was adopted. An initial programme - probably an "appetiser" including instructions for obtaining the leaflet - was aired on 9 March, followed by a pause to allow distribution of the leaflets. The series resumed on 23 March with four more parts, concluding on 13 April. None of the Radio Times listings for the series included instructions for obtaining the leaflet; nonetheless demand was almost as brisk as before. There were 25,000 applications immediately, followed by a steady demand of around 100 requests per day for some time. The Space Race was, of course, still in full flight and fuelling scientific interest: the US had launched their Vanguard 2 weather satellite in February. The Focus Transistor Set - This series raised almost as much interest as the earlier one-valver series. Some stories by those who remember the series. Notes on the leaflet and the design. Download - please read the copyright and usage notes on that page, and the copyright notice on the WELCOME page. My Focus Set - My recently built version of this simple set. As you will see, there are four pages in this section devoted to the earlier series (Studio ‘E’), and only two for the Focus series that followed. This is simply because the Studio ‘E’ series was the formative experience for me, and was my own introduction to Gilbert Davey's work. I have redressed this imbalance a little by building my own Focus set, but I would be glad to hear more stories about it, or you might even like to rebuild it yourself and send me pictures!